Using fermented vegetables in meal preparation is as easy as opening a can of vegetables or a bag of frozen vegetables except that your food is alive, nutrient-dense, and you know what went into it. Fermented foods are truly a convenience food: Once you have a few key ferments on hand, you have an infinite number of meal starters. This chili uses Fermented Green Chile Salsa that is not only a salsa but is also incredible when added to beans or grains for a wonderful southwestern flavor. While making this simple chili requires some planning ahead—as you will need to start soaking the beans the day before—when it comes to the crunch time of a daily meal, it involves very little time to prepare. Because the fermented chili base is added after the chili has been taken off the stove, it lends a bright, fresh flavor to the dish. You can adjust the amount of chili base you add to fine tune the heat to your liking. The basic green chili base has a medium heat that we think makes comfortable chili for most people. For more of a fire-engine flavor, garnish individual bowls with your favorite fermented hot sauce. 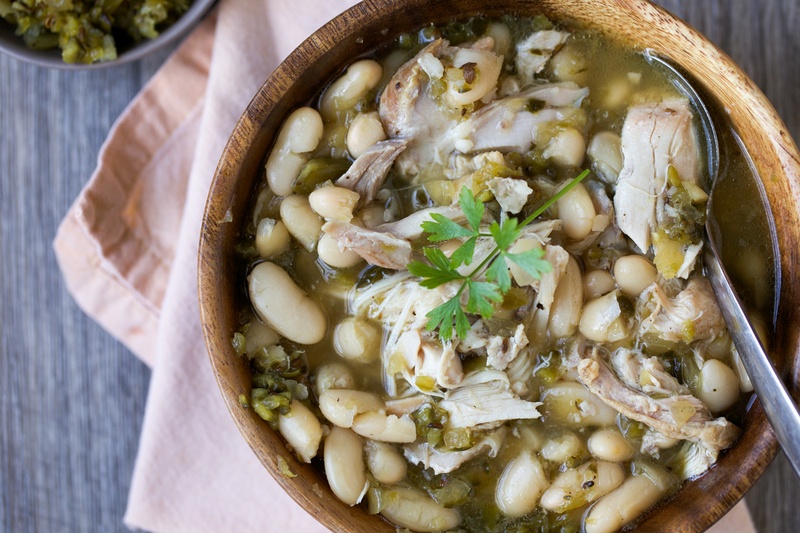 This Green Chile Chicken Chili makes an easy weeknight meal if you toss it in the slow cooker so it's ready when you get home from work, or you can prepare it on the stove. 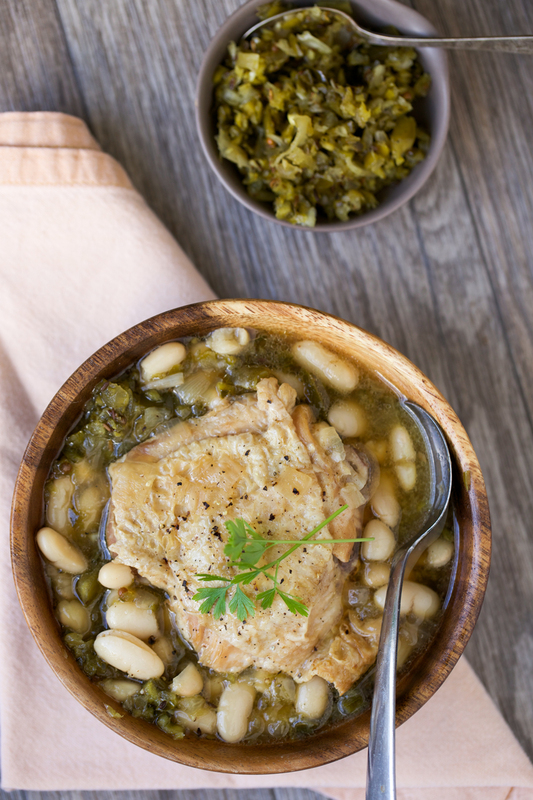 Chicken thighs simmered with tender beans in a rich broth give this chili an amazing, rich flavor while a dollop of Green Chile Salsa swirled in at the end gives it a lovely punch of piquant flavor. Pick over the beans to remove any stray bits of debris, and then place the dry beans in a bowl. In a separate pitcher, dissolve the baking soda in the water. Pour the water over the beans and let them soak at room temperature for 24 hours. Drain the beans and rinse them well. Heat the oil in a Dutch oven or pot over medium-high heat. Place the chicken thighs, skin side down, in the oil and sear until browned, about 8 - 12 minutes. Turn to sear the other side, another 10 minutes. Remove the chicken from the pot and set aside. Add the onion to the pot and sauté until it begins to brown, about 10 minutes. Add the beans and stir quickly to coat with the oil. Add the broth and return the chicken to the pot. Bring to a boil, skimming any foam off the beans if necessary. Then reduce the heat and simmer until beans are tender, about 3 hours. Remove the chicken thighs with a slotted spoon and allow them to cool. Remove the bones and skin and return the chicken meat to the chili. Stir in the fermented chili base and serve hot. Can I use a slow cooker? After browning the chicken meat, simply transfer the ingredients to a slow cooker (we recommend the VitaClay Slow Cooker which has a lead-free insert), and cook on low for 3 hours. Finish the dish by removing the skin and bones from the chicken thighs, and stir in the salsa. Can I use a pressure cooker? After browning the chicken meat, transfer the ingredients to an electric pressure cooker (we recommend the Instant Pot), and cook for 1 hour. Finish the dish by removing the skin and bones from the chicken thighs, and stir in the salsa. What if I don't have fermented salsa? Part of the charm of this dish is that it makes use of a fermented food you can make at home. If you don't have any on hand, you can substitute any salsa verde of your choice. Reduce the cooking time accordingly. Can I use canned beans? If you don't have time to soak beans in advance, we recommend these organic cannellini beans packed in glass jars. Between work, chores, and toting kids to tap dance and soccer practice, it can be difficult to consistently put a wholesome, nutrient-dense and affordable meal on the table every night of the week. Meal planning can definitely help as can meal delivery services like this one that uses organic ingredients. We use this meal planning system, and you can even add Nourished Kitchen recipes to your meal plan schedule. 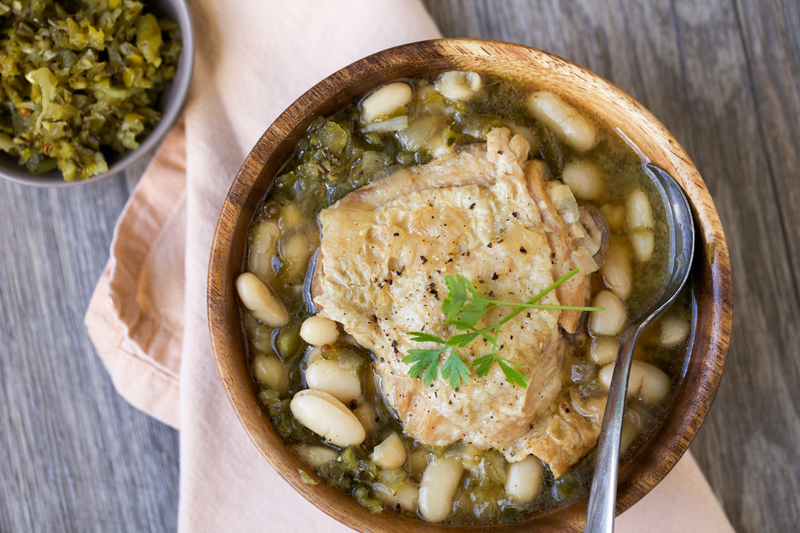 If you like this Green Chile Chicken Chili, you might like these other easy, wholesome one-dish suppers. You can find other wholesome one-dish suppers in the Nourished Kitchen Meal Plans by Real Plans. Sprouted Lentil Chili is flavored with caramelized onions and a mix of dried chiles for an easy, nutrient-dense supper. Quick Pho will come together in about 15 minutes as long as you have some long-simmered beef bone broth on hand or in the pantry. Salmon Chowder with Dill and Roe sounds fancy, but it’s really easy to make and super nutrient-dense. Mmmmm! I love a chili verde. This one looks comforting but not too heavy. Perfect to make ahead and have meals during the week. I’m thinking tacos. Inspiring and lovely!